This is the first of a series of posts by our new apprentice Tom Wiggins. 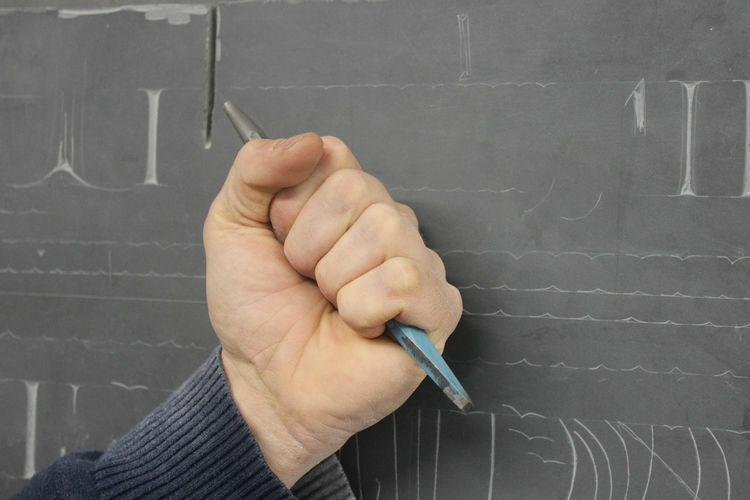 It offers an excellent insight into the process of training to be a letter carver. 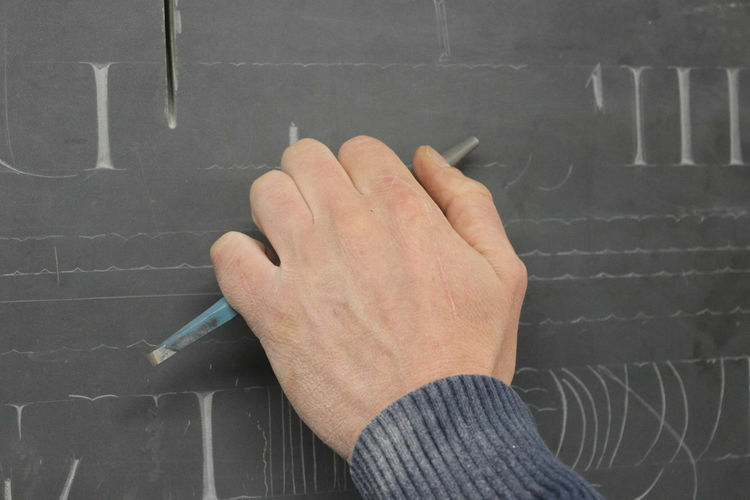 Fergus began by getting me to cut some small diamonds in a practice panel of Welsh slate. In spite of my stonemasonry training (or perhaps because of it), I’ve never actually carved in slate, so this material was completely new to me. The example diamond he cut was beautiful, and I was quite sure I wouldn’t be able to cut anything that beautiful for years. It was crisper than crisp and made all my subsequent diamonds look decidedly rough! He picked up on a few things quite quickly: for one thing, I was holding the chisel incorrectly (your thumb of your chisel hand should be sat resting on the top side of the chisel next to the index finger rather than being underneath to aid control); secondly, he told me I was gripping the chisel far too tightly. 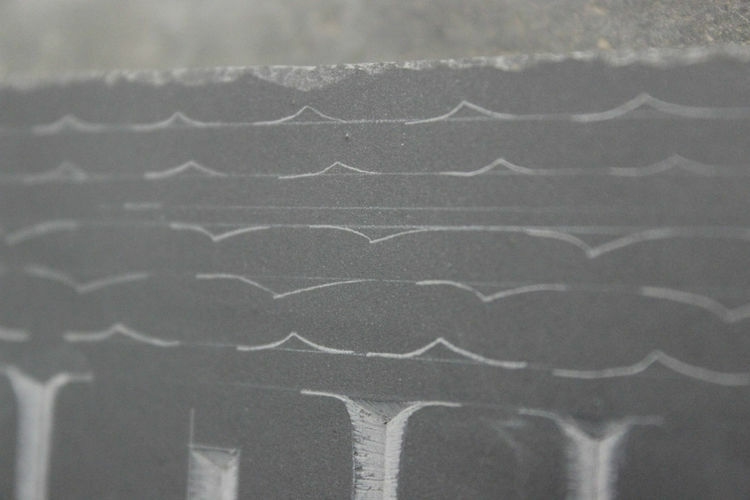 The sound of the chisel makes a different noise when you’re cutting slate with a firm grip. Fergus said that your hand should be loose and relaxed when you’re carving. Shortly after, he noticed that I was going way, way too fast. Getting my mind out of the mason’s mindset seemed to by the theme of the day. I needed to forget the hard and fast principles that underpin masonry - or at least commercial masonry - in which you’re encouraged to work stone as fast as possible. This was a different world. This was the world of the good and the slow, not the fast and the furious! So my stonemasonry training at Bath College isn’t doing me any favours. I was too fast and too heavy-handed. Before Fergus realised the extent of my heavy-handedness, he got me carving the letter ‘I’. When he returned to the workshop, he saw that each attempt had become progressively worse. He watched me as I carved one and saw that I needed to practice tool control a lot more. I’d been struggling with the securing line up the spine of the letter ‘I’ because I was still getting to grips with striking the chisel lightly when chasing from the bottom to the top of this letter. 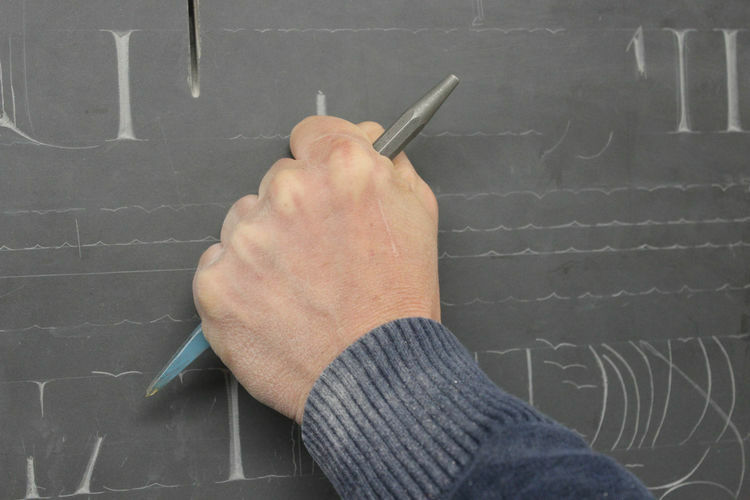 I was desperate to make a good impression with my hand skills, but found out really quickly that I needed to forget most of what I knew: the skill of a mason is a world away from that of a refined letter carver. It’s chalk and cheese. It was going to take some time to really nail the lightness of touch, grip and strike required to become a competent letter carver. I finished the day following straight and curved lines, but even that ended in complete failure - too heavy-handed again. My lines were still much too thick, even though I thought I was making a conscious effort not to be! I then went much lighter – or my understanding of much lighter – but when Fergus came over to have a look, he was pleased but said it needed to be lighter still! Tomorrow I will go light. It will be The Charge of the Light(ness of touch) Brigade! Another good day. I’m making okay progress, but Fergus does have to keep reminding me to slow down and – yes, you’ve guessed it – maintain a lightness of touch. My chisel on default is set to high so I really need to work on developing and maintaining that softness needed for the fine letter carving I see all around me in the workshop. I started off well enough. I gave myself the task of carving small squares with very thin borders, then carving a slightly smaller box inside that and so on, like the geometric equivalent of Russian dolls. The finer details of the smallest boxes meant I had to slow down as the exercise went on, which did the trick in the morning at least. Fergus got me back onto carving a diamond shape, and after some guidance, there was a definite improvement upon yesterday’s diamonds. It’s clear that Fergus is going to be an excellent teacher. He’s not taken a passive role at all; he tells me as soon as he notices when I’m doing something wrong and how to correct it and improve. 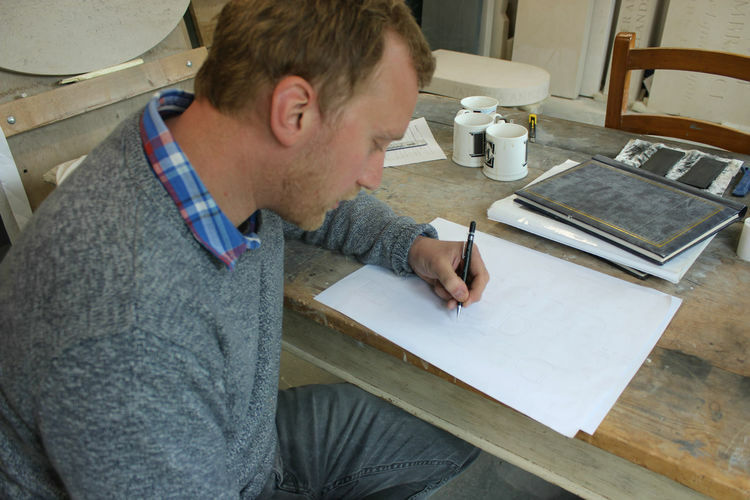 After Fergus had a meeting with some clients in which he went through some ideas of a headstone they wanted him to carve, he drew out some more letter I’s for me to attempt again. I’d practised carving serifs after the squares within squares exercise. Fergus approved of the practice I was putting in with the serifs, because they’re a very important part of a letter. If they look bad, it can throw out the letter completely. My tool control is improving, but I’m still reverting to a mason’s mentality of speed and power rather than the absolute necessity of a very light hand in an untimed environment. Time is no factor in this place. Things take however long they need to take to enter the realms of perfection. Fergus thinks it will be quite hard to get these habits out of me but knows that it can be done. I know what the struggle’s like; I’ve already been through this type of struggle at masonry college so I know the main ingredients of this process is time and patience. James, the other letter carver in the workshop, loved all the doodle carvings I’ve been doing on the practice panel I’ve been given. He said that usually, they find that people are too scared to carve too much, but I plowed into it with (very rudimentary) swirls and lines all over the place. At least masonry college taught me not to be too proud about things. The practice panel is now full of carved graffiti! I would say it’s been my best day of the week so far. I spent the whole morning carving serifs. Their quality came in waves until about midday when James suggested I use a slightly lighter dummy hammer and the technique seemed to fall into place. Well, I say fall into place – when it came to carving the serifs on the letter I’s at around lunchtime, I’d more or less forgotten everything I’d practised. But it was funny in a way to spend the whole morning carving a hundred or so serifs as a practice, only for it to result in an infant’s version of a serif when it actually mattered. It was laughable like I’d carved it in a moving car, or on a boat. But that’s part of the appeal of learning a craft. Moments like these are there to be worked through. I’ve been through the same feelings when working a flat surface at masonry college so that feeling of disappointment when you’ve made yet another mistake is certainly nothing new. In fact, it was funny and mildly nostalgic in a way to make so many mistakes. It makes getting it right – when I eventually do get it right – feel very well earned. I’m pleased with my progress on the letter ‘I’. They’re still pretty ropey, but they’re improvement on Monday’s somewhat abstract version of this letter. I really made sure I slowed down when I came to my third ‘I’. When I say slowed down, I don’t mean to the speed that Fergus requires, but I’m getting there. Slowness it seems has to be learnt. When I start my apprentice panel in which I will carve the whole of the alphabet in capitals, he wants me to spend a day on each letter. James said that he averaged two letters per day when he did his own panel five or six years ago. 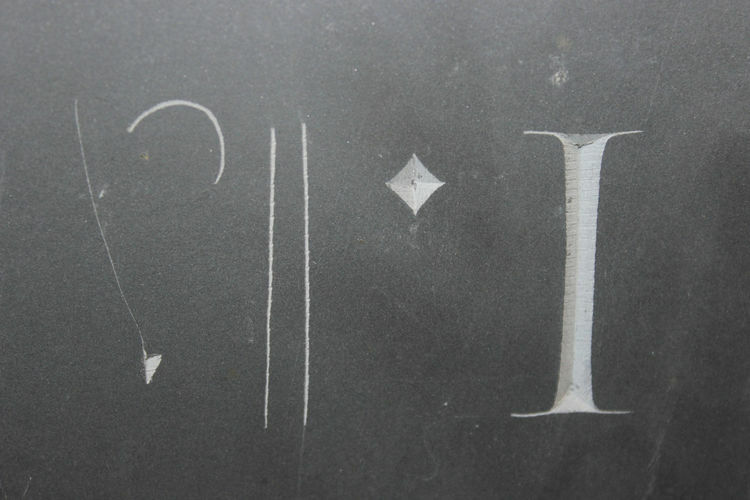 For the letter carver, stonemasonry skills are a bit of a curse. But everything can be learnt and even after only three days, I know I’m improving already. When Fergus is in the workshop, he can tell by the sound if I’m holding the chisel too tight by the sound it makes on the slate. “Loosen your grip,” he’d say, and as soon as I do that, my work becomes neater. You’d think you’d have to hold your chisel tighter to enhance your control, but when you’re tight, you’re tense. A loose and relaxed grip actually increases control. The same can be said for sportspeople. They can’t operate at their peak when their muscles are tense. Boxers are more powerful when they’re relaxed. There’s a lot to be said for loosening up, both in sport and letter carving. I’ve also tried to focus on my breathing, especially when carving something as light as a serif. A slow exhalation while cutting the serif really helps me focus on that lightness of touch needed to form something a fraction of a millimeter wide. Breathing also helps you return to “the moment” – being in the present is crucial when letter carving. Mental or physical discomfort such as something weighing heavy on your mind or being at the wrong height on your chair can have a detrimental effect on the quality of your carving. A clear mind is a relaxed mind and a relaxed mind means relaxed muscles, and I’ve already described what relaxed muscles lead to. When we got back from fixing a headstone in Bicester, Fergus set me up on a drawing board and he drew out an A and B for me to copy. 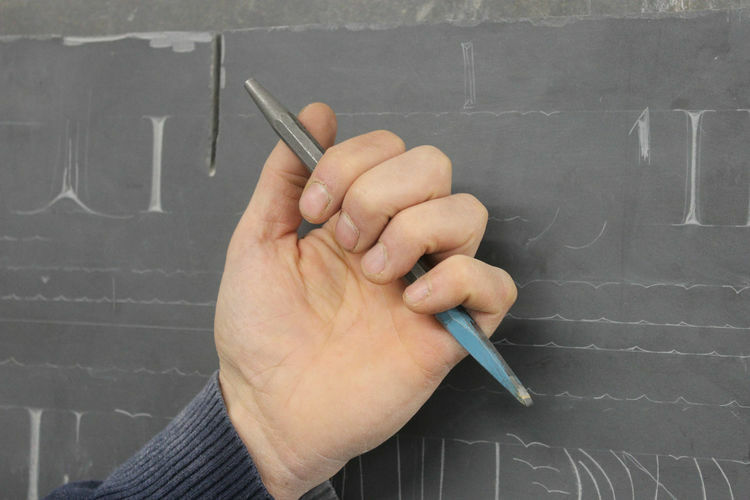 The traditional letter carver draws his or her letters freehand – there are no rulers (apart from drawing guidelines for the height), no templates, no stencils. Just a pencil, the hand and the eye. Having had about four weeks’ practice on drawing out letters already, I was a little bit better than a complete beginner. I’ve held pens and pencils in my hand for longer than I’ve held a dummy hammer and chisel, so the process of drawing letters comes much more naturally to me than carving.